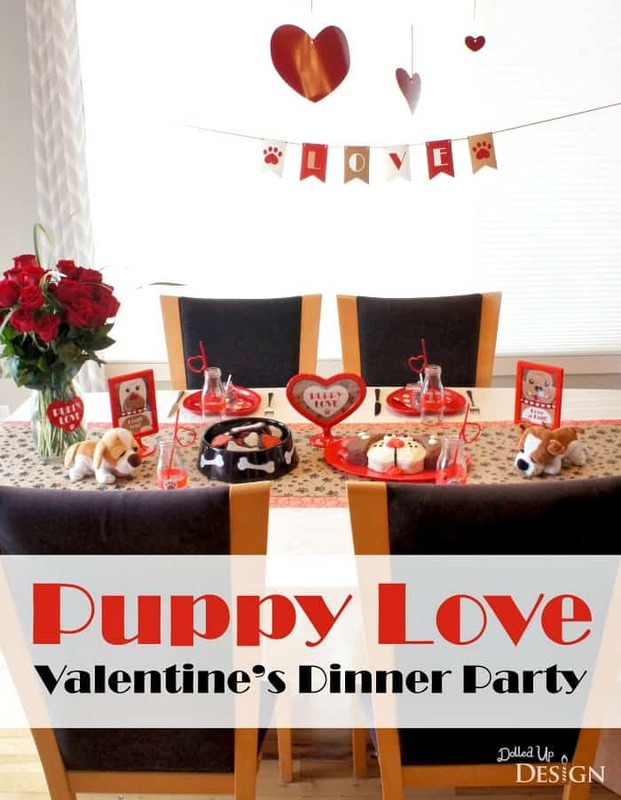 This Puppy Love Dinner Party post is courtesy of our contributor Chantelle of Dolled Up Design…Valentine’s Day is just around the corner and what better way to celebrate than with a special Valentine’s dinner party for the family? 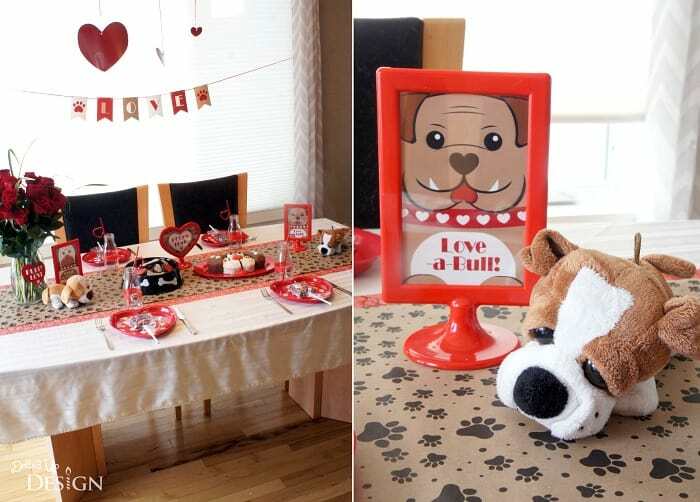 My Puppy Love themed Valentine’s Party is inspired by our love for our furry family members and it makes for a great way to celebrate with kids. It doesn’t take much to turn an ordinary dinner into a special celebration. 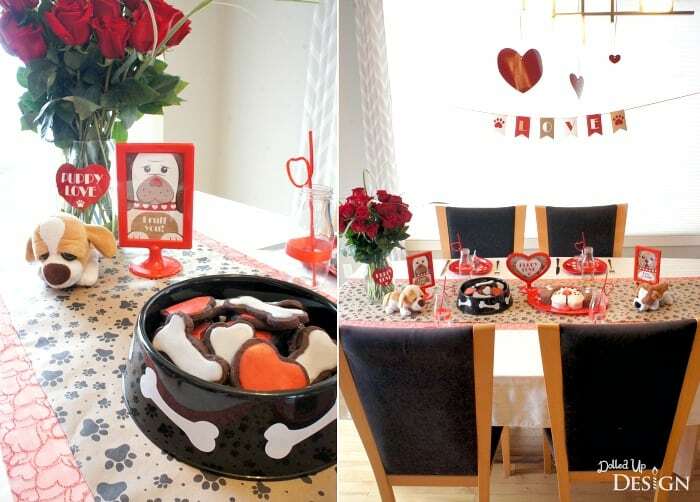 With a few simple printables and a quick shopping trip to the dollar store and grocery store, I had everything I needed to carry out my theme. 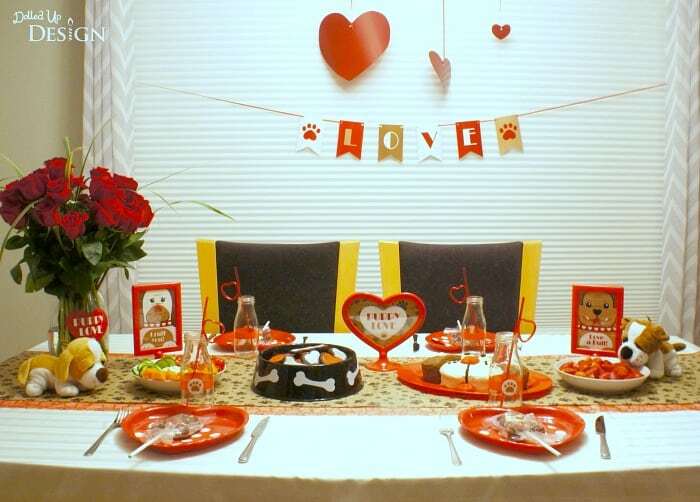 To cover the table, I used a cream colored table cloth layered with a runner made up of red fabric and paw print wrapping paper I found at Dollar Tree. 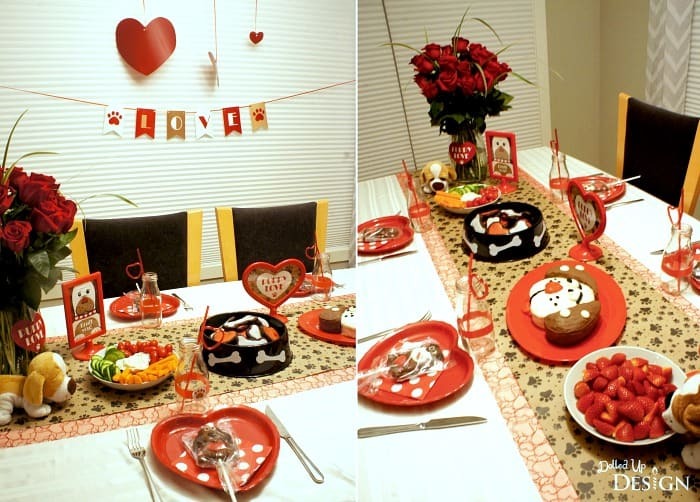 A vase of red roses and some plush dogs helped add decoration and whimsy. 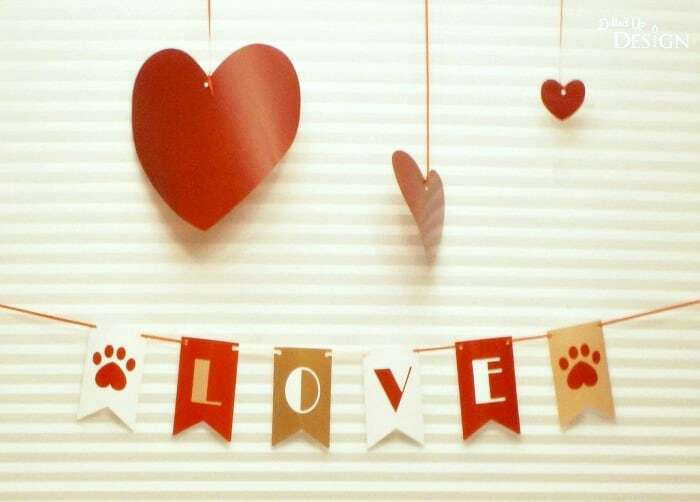 Keeping with the theme, I also designed a simple “Love” banner and some quick doggy printables to put inside the red plastic IKEA frames I already owned. 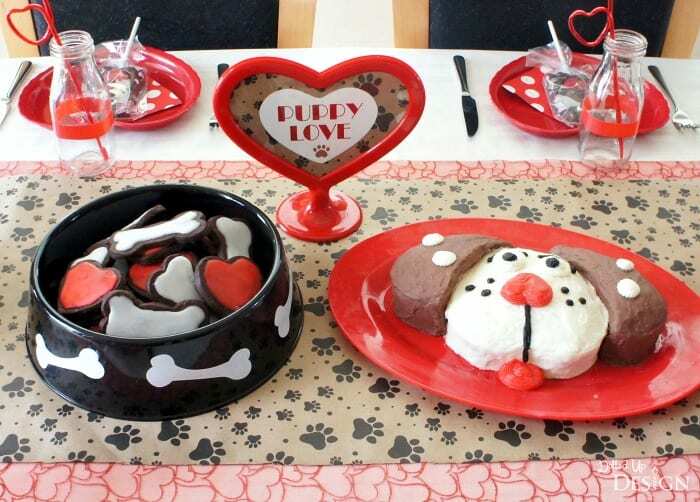 At each table setting, I had these fun red heart shaped plastic plates along with adorable puppy shaped chocolate suckers I came across at both Dollar Tree and Walmart. My puppy shaped cake was made by baking two cakes in small heart shaped pans. One heart made up the white face, and the second heart was split in half to form the two chocolate buttercream coated ears. I also decided to bake up some simple chocolate sugar cookies cut into bone and heart shapes. These looked great served in a plastic dog dish I found at Dollar Tree. 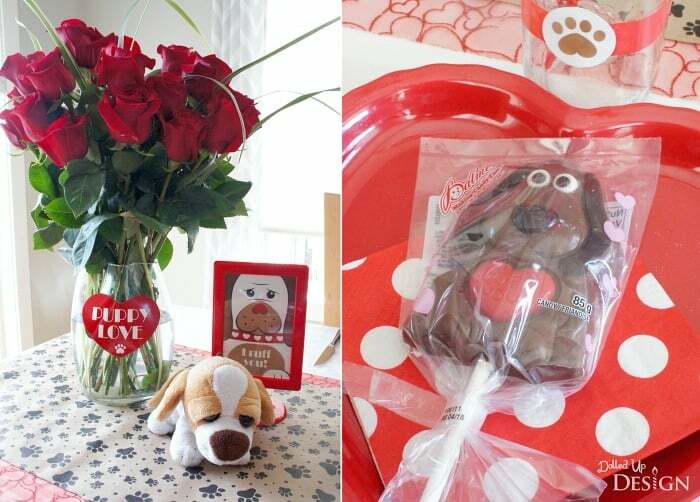 If you don’t have time to bake cakes or cookies, Valentine’s themed cupcakes or cookies from the grocery store would be great for your Valentine’s day dessert. To drink, I wanted something red so I ended up grabbing a bottle of cream soda. 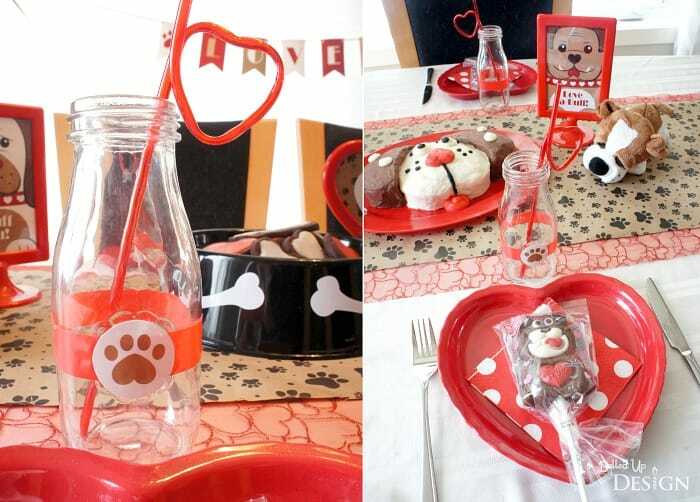 The kids loved drinking this out of themed milk bottles with matching red heart shaped straws. 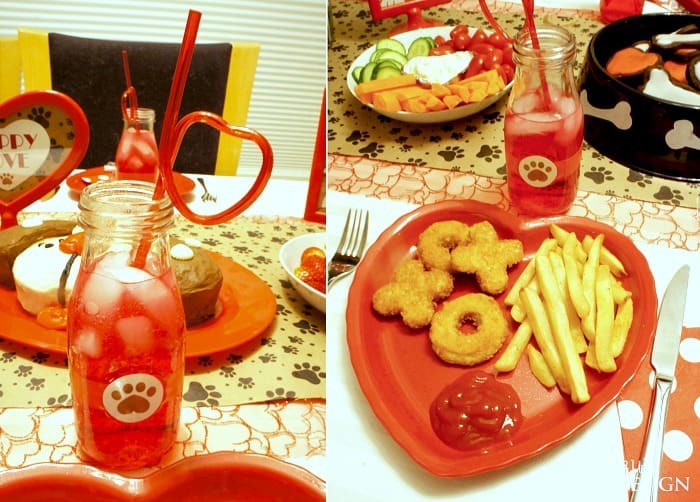 If you don’t like giving your kids soda, cranberry juice or fruit punch would be other great red drink options. For dinner, I took the easy way out and went with kid-friendly chicken and fries. I found these amazing X and O shaped chicken nuggets at my favorite grocery store and knew right away they would be the perfect “Hugs and Kisses” to serve for Valentine’s Day. 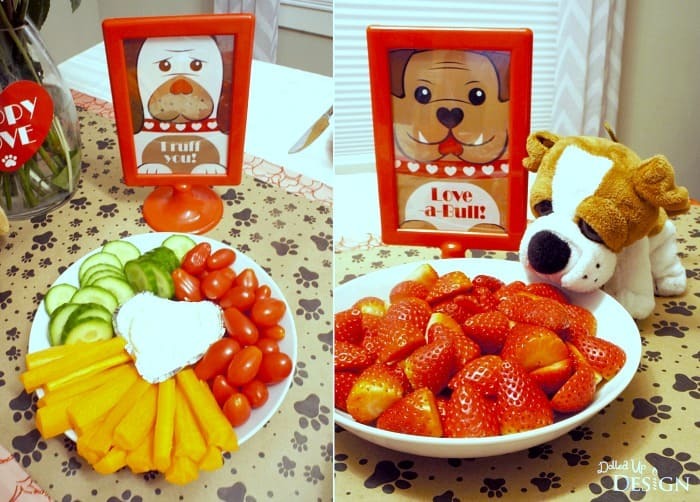 For a bit of nutritional balance, there were also veggies and dip and fresh cut strawberries. It didn’t take long for my daughter and I to bake, decorate and pull things together the day of our dinner party. It was a fun surprise for my husband and son to come home to, and everyone enjoyed the special little touches to make the holiday special. There really is no right or wrong way to throw a dinner party for your family, so give it a try! It went over so well in our house that I look forward to surprising everyone with another themed dinner party in the near future. This is so cute. Do you have a link to the printables? Hi Suzie! I’ll check with Chantelle and we’ll get back to you shortly!